Living Proof Your Words Matter! The baby boy, above, Jah'khari Malachi, is living proof of the impact you can make when you speak out for life. His mom intended to obtain an abortion in September 2015, but God intervened through friends who helped her choose life. You can read the story of what happened on Broward Right to Life's Sanctity of Human Life bulletin insert, shown above. It's available free, in quantity, to Broward churches to help defend women and unborn children from the devastating impact of abortion. If you are a pastor or church leader, request this free resource for your congregation today! Share the truth about abortion--and the powerful difference a loving witness for life can make by requesting Broward Right to Life's 2017 Sanctity of Human Life bulletin insert. To make your request, please use form at right. 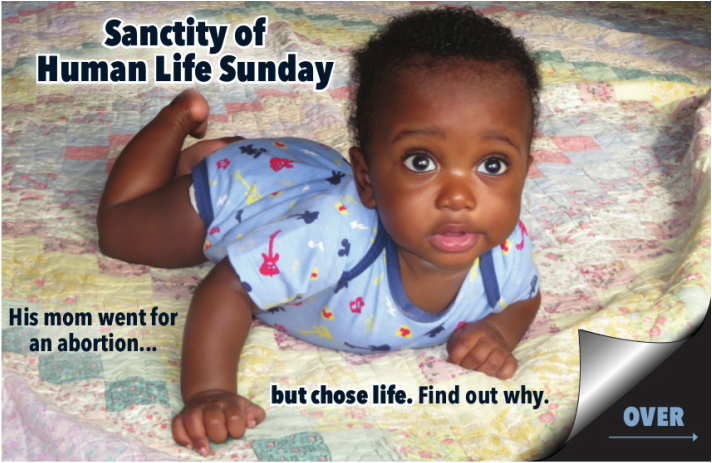 Request Free Sanctity of Human Life Bulletin Inserts for Your Church!